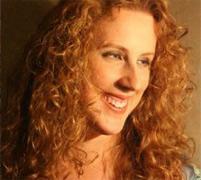 Pianist/vocalist Deanna Witkowski was a guest on Judy Carmichael's Jazz Inspired recently. Hear an interview we recorded with her via telephone in 2009. Deanna Witkowski's fourth CD release titled 'From This Place' (Tilapia Records) is her first focusing on sacred music--music which she says she's wanted to make for the last several years. Pianist/composer/vocalist Deanna Wikowski is a classically trained musician who explores jazz and other genres of music. 'From This Place' merges ancient and modern texts with the style of jazz music. Deanna's new CD features her core quartet: Donny McCaslin on saxophone, John Patitucci on acoustic and electric bass and Scott Latzky on drums. In addition, 'From This Place' features guest vocalists Kate McGarry, Laila Biali and Peter Eldrige (of New York Voices).